Champion distaffer Inside Information passed away this week. She holds the record for the largest margin of victory ever in a Breeders’ Cup race, 13 1/2 lengths. Let’s take a look back at her devastating win in the 1995 Distaff over the likes of Serena’s Song, Mariah’s Storm and stablemate star Heavenly Prize! YouTube: Seconds after Inside Information scored the most decisive victory in Breeders’ Cup history, the sun appeared for the first time Saturday. Apparently, even the heavens were impressed with the 4-year-old filly’s 13 1/2-length destruction of her nine rivals in the Distaff. 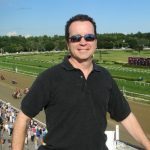 Called by some in the days leading up to the Breeders’ Cup the most competitive of the seven events, the Distaff instead turned into a showcase for Inside Information, trainer Shug McGaughey and owner Dinny Phipps. In addition to watching the daughter of Private Account shatter Princess Rooney’s record (seven lengths) for easiest Breeders’ Cup victory, McGaughey and Phipps saw her entrymate, Heavenly Prize, rally from far back to get second, more than two lengths in front of Lakeway. Proven already over off tracks, Inside Information moved to a new level Saturday in what was her final start, and in so doing, wrapped up the Eclipse Award as the nation’s top older filly or mare. The entry paid $3.60 as the 4-5 choice. Her final time over a surface labeled good was 1:46, the fastest for the Distaff since the distance was shortened from 1 1/4 miles to 1 1/8 miles in 1988. The victory was her seventh in eight starts this year and 14th in 17 lifetime. “If that wasn’t an Eclipse Award performance, I don’t know what is,” jockey Mike Smith said after the first of his two Breeders’ Cup victories Saturday. Great Horse Racing Videos – Fastest Race Horse in the World? Is this the fastest finish every witnessed in a Thoroughbred horse race? Unfortunately, we have no data on this race that tells us the actual track or time, etc. However, visually this finish is simply unbelievable. Zenyatta had nothing on this runner! Check it out and comment below what you think of this horse racing finish. Let us know who you think was the best closer of all time. Great Horse Racing Videos – A Star is Born? Leading Santa Anita trainer Phil D’Amato unleashed a first time starter, the 3yo filly Enola Gray. The performance was reminiscent of the great filly Melair, who won ‘ran them off their feet’ like this in California a few decades ago.